Sutton Coldfield High Street is a Conservation Area, “an area of special architectural and historic interest, the character or appearance of which it is desirable to preserve or enhance”. The area was recently reviewed, and earlier this year the City Council issued a Character Appraisal and Management Plan for the High Street area. This document mentions Vesey House, 5-7 High Street, as “built in the 1630s, it is the first known example in the town of a house constructed in brick”. Evidence for this statement was found by the researcher, Toni Demidowicz, in the probate records, which showed that it was under construction in 1635, being built in brick by John Burges, the Rector of Sutton at the time. It was on the site of an older house belonging to Ursula Gibbons (late of New Hall), who died in 1628. This house had been bought by John Burges for his wife Lettice - Lettice was the great-granddaughter of Hugh Harman, the brother of John Harman alias Vesey, Bishop of Exeter. The house where Ursula Gibbons lived was a large timber-framed house, sadly in need of repair when Burges bought it, and he demolished it in order to replace it with something up-to-date and Jacobean.. In 1620 this part of High Street must have had a very Tudor air, as the next door house, now 1-3 High Street, was a timber-framed inn called the White Hart. The White Hart caught fire and was burned to the ground in 1623; it belonged to Emmanuel College, Cambridge. The 1624 lease for the new building erected there was to Edward Willoughby (Warden of Sutton in that year) on favourable terms “in consideration that the said Edward Willoughbie hath…at his expenses and charges Re-edified and new built from the grownd one messuage or tenement of freestone contayning in length fifty fower foot in height Twenty Fower foot and in breadth eighteene foot with thirteen Brick Chymneys besides back buildings adjoining to the same viz a Cellar, Butterie, Kytchin, great chamber and certain other lodging which being heretofore an Inn of tymber building was lately burned by accident of fyre to the grownd call’d or known by the name of the White Hart”. The 54-foot main range of this building was of sandstone construction, but the “back buildings” were not merely lean-to extensions but including a handsome “great chamber” using the more versatile medium of brick. Brick was still regarded as something of a luxury in 1620, associated with the palatial houses of the rich such as Hampton Court, and in Sutton Bishop Vesey had built himself the palatial Moor Hall in brick in the 1520s. The brick buildings at 1-3 High Street pre-date 5-7 High Street by ten years, but as they are only part of a larger stone house, Vesey House can still claim to be “the first known example in the town of a house constructed in brick”. 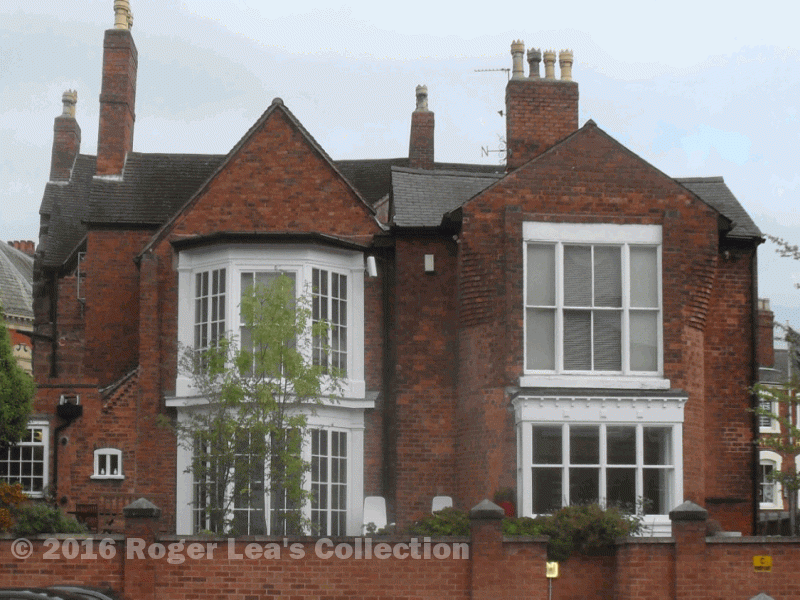 One of the gables at the rear of Vesey House, 5-7 High Street, brick with stone quoins and window frames, c.1635. Rear view of 1-3 High Street. 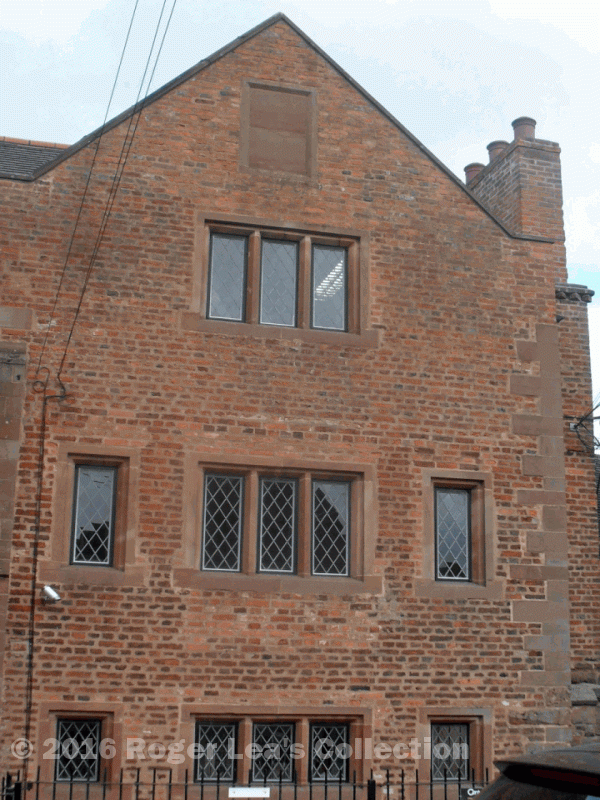 The end of the stone range can be seen on the extreme left, with a parallel brick range in front of it - this and the left-hand gable are probably part of the original 1623 building (but not the windows); the buildings with the shallow-pitched roofs on the right date from about 1800.